At Two Chefs On A Roll Inc., Carson, Calif., we manufacture a full range of custom savory and bakery products in a state-of-the-art, “certified organic manufacturing facility.” Founded by Culinary Institute of America graduates Lori Daniel and Eliot Swartz in 1985, the company began operations as a wholesale dessert company specializing in distinctly American sweets. Today, Two Chefs On A Roll produces 7 bakery and 10 savory product lines totaling approximately 100 stock keeping units which are marketed globally to food manufacturers, retail food outlets, and casual dining food services. Our success is an example of perfect market timing and product ingenuity. Founders Daniel and Swartz saw the requirement for easy-to-prepare gourmet dishes comprised of all natural ingredients and set about to develop quality products to fill the need. Using a combination of their culinary studies, restaurant background, and extensive world travels, we developed unique, tasty product lines to satisfy the pallet and today’s fast-paced lifestyle. Currently, more than 195 employees extend the vision, supporting preservative free, all natural food manufacturing, and an unswerving dedication to quality products, superior service, and doing what others won’t. Joe Alonso attributes the company’s surging growth to a formula that includes creative, high quality food solutions, top-of-the-line ingredients, flawless manufacturing techniques, resourceful marketing, and an enterprise resource planning (ERP) software solution from SYSPRO, Costa Mesa, Calif. It was the move to a new manufacturing facility in April 2003 that prompted us to conduct a search for a new ERP software solution. When we relocated our manufacturing plant, tripling our physical space and manufacturing capacity, we realized it was also time to implement an ERP solution to support our growth and future needs. We had been using outmoded accounting software, which was not only limited in functionality, but was no longer being supported. The “wish list” for the new system included an integrated solution and support for bar coding to reflect industry standards. After an extensive search, the choice narrowed to SYSPRO ERP software. In addition to extensive integrated ERP capabilities, SYSPRO also offered bar-coding support. More importantly, it provided in-depth lot traceability and allergen tracking throughout the manufacturing process, key requirements for quality food processing. Assessing the impact of the software, I believe it enables us to react more quickly to changing market conditions and customer requests with added flexibility and knowledge. The software is integral to our purchasing decisions and material requirements planning (MRP) recommendations. Previously, purchasing and MRP decisions were calculated manually. Consequently, we feel we have added functionality and better control and reporting of our manufacturing processes. While we are still fine-tuning our implementation and establishing new reporting formats, we have gained the lot traceability and allergen tracking that we required, and we can properly measure product and customer profitability. Presently, Two Chefs On A Roll is in the process of implementing a bar-coding system to enable us to scan and track all product movements throughout the plant from receiving, raw material storage, work-in-process, finished goods, and shipping. When fully functional, the bar-coding solution will further improve internal control of inventory and produce more accurate inventory information on which we can base purchasing decisions and better manage cash flow. Joe Alonso, Chief Information Officer for Two Chefs On A Roll has the SYSPRO software loaded on an Enterprise Class Dell Server running Windows 2000 with mirrored drives and another Enterprise Class Dell Server running a SQL database with RAID5 hot swappable drives. Joe has been the primary catalyst in implementing the Bar-Code for Impact software which integrates with SYSPRO software throughout our manufacturing processes. The manufacture of food products requires a system that is real-time and efficient and at the same instance has the ability to effectively track production costs in a fast-paced environment. In order to maintain quality, nothing can hold up the delivery of the product and the end-product is shipped out fresh as soon as possible. A cumbersome system would hold up delivery and create a backlog of data capture resulting in a system that produces historical information only. 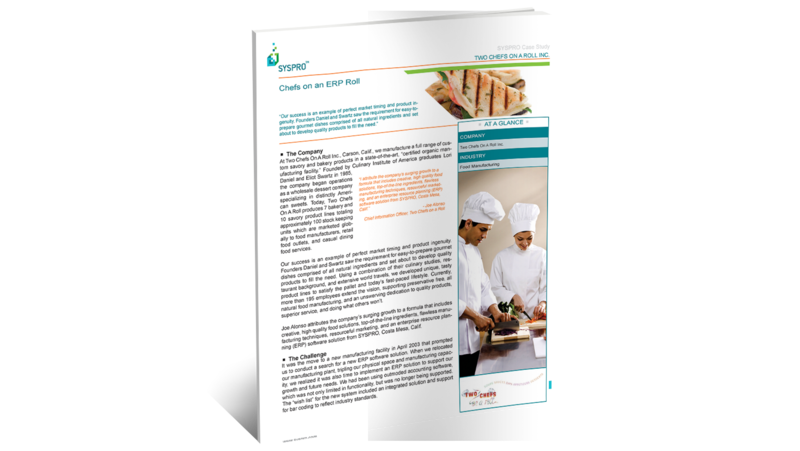 The SYSPRO system with integrated bar-code capabilities allows Two Chefs On A Roll to be proactive and make decisions on information that is current. It gives management the ability to pre-empt and leverage off situations as opposed to being reactive. Two Chefs On A Roll Inc.